The trajectory and above all the high velocity of the asteroid ‘Oumuamua made its discoverers think that it was a comet from the outer solar system. After the first observations, however, the lack of traces of activity in the form of coma and tail led to classify it as an asteroid. The question is complex because it’s possible that it contains a considerable amount of water but below its surface. In this new research the possibilities concerning the nature of the planetesimal of which the asteroid ‘Oumuamua may have belonged are assessed. Inevitably, such assessments are based on hypotheses but they’re partly founded on observations of celestial bodies and on the dynamics observed in the solar system. For example, the probabilities that ‘Oumuamua was part of a planetesimal with a cometary nature are based on the idea that objects that formed away from their star retain water while those near it lose it due to the star’s heat. The objects farthest from their star are much more likely to escape its gravity. According to the researchers, the presence of gas giants in a star system could tear apart planetesimals that pass too close to them and project at least a part of the fragments outside their system. This would also explain the strange form of ‘Oumuamua, one of the anomalies that left the astronomers puzzled from the beginning. According to the authors of an article published a few days ago in the journal “Monthly Notices of the Royal Astronomical Society” the asteroid ‘Oumuamua comes from a binary system. That conclusion derives from an estimate of the probability of being ejected from a system of that type, which is greater than a one-star system. Another conclusion is that one of the stars of its origin system is massive and therefore hot because it’s more likely to eject an asteroid than a comet. One problem with these estimates is caused by the fact that we know little about ‘Oumuamua’s composition. If it really contained a lot of ice water it could also come from a system with one or two medium-small stars. There’s a whole range of possibilities so it could come from a binary system with one or more gas giants. In short, one possibility doesn’t necessarily exclude the other and both teams of researchers could be right. 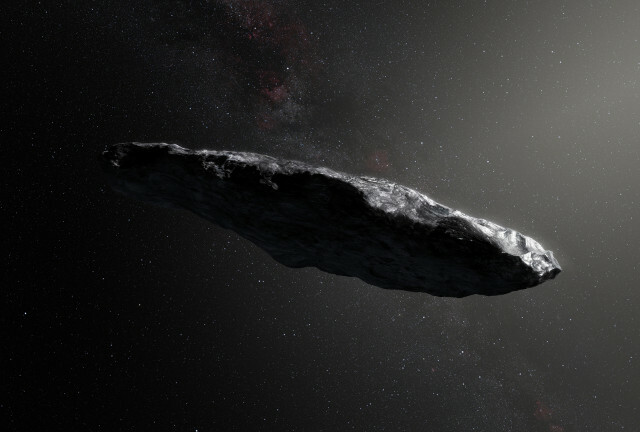 After the discovery of ‘Oumuamua the interest was high for the first interstellar asteroid but it’s moving away from us and this makes its study increasingly difficult. The growing number of asteroid surveys to assess the potential danger they pose to the Earth could allow us to find more celestial bodies that came from other star systems that will give us more clues about their formation.